UT Austin places emphasis on collaboration with others in its two year, full-time MBA program. Before classes begin, students compete in the Cohort Olympics during an MBA Orientation. This competition gives new students a chance to get to know the others who will be in their cohort. There are 11 required core courses, each of which are worth two or three credits a piece. Students also select from a variety of elective courses and may pursue a concentration if they wish. The UT Austin full-time MBA curriculum at McCombs begins by giving each student the same fundamentals of business. This is done through the core curriculum of 11 classes, which provide a functional foundation of essential business skills like effective communication and cross-functional problem solving. It simultaneously encourages the student to customize their degree with flexible core elective requirements. Dual degree options that allow students to receive an MBA as well as another graduate degree from a different college within the University of Texas at Austin are also available. The 2020 UT Austin full-time MBA class has 289 students, 38 percent of which identify as female. The average age of students in the class was 28. On average, students enrolled with an undergraduate GPA of 3.49, a GMAT score of 703, and 5.6 years of professional work experience. The majority of the Class of 2020 are Texas residents (40 percent), with 35 percent non-Texas U.S. students, and 25 percent international students. The McCombs School of Business is usually ranked among business schools in the U.S. for the number of MBA graduates who get job offers. The median salary of UT Austin full-time MBA graduates is around $115,000 with a median signing bonus of $25,000. For the first year of the UT Austin full-time MBA at the McCombs School of Business, in-state students pay $49,534, and out-of-state students pay $54,924. McCombs also estimates an $850 MBA student fee, $2,500 for a laptop, $1,000 for books, and $18,060 for living expenses. The first year’s total cost is estimated to be $62,910 for in-state and $76,910 for international and out-of-state students. McCombs offers some scholarships and fellowships for new and returning students. Each student is considered for a recruiting scholarship when they apply. It is exclusively merit-based and rewards range from $2,000 to full tuition. They come in the form of cash awards and out-of-state tuition waivers. No additional paperwork is needed for consideration. Continuing Student scholarships allow students to apply during their first year for merit and need-based scholarships based on their academic performance and on-campus involvement during the first year of the program. Full-time graduate students are eligible for federal loans of up to $20,500. 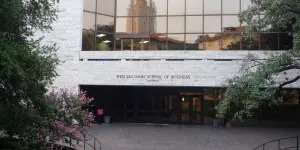 Applicants to the UT Austin full-time MBA program at the McCombs School of Business must have a Bachelor’s degree or a comparable degree from a foreign academic institution. The application process takes place online and applicants must submit a completed application, official transcripts, GRE or GMAT scores, a current resume, one professional recommendation letter, and a $200 application fee. Students also must complete two essays and an optional third. The first essay is an introduction of the student. It can be completed in one of two formats: a 250 word essay ora one minute video. The second asks the applicant to explain their motivation for choosing McCombs. The optional essay is an opportunity to explain any area of concern with your application. International applicants must also submit TOEFL or IELTS scores. Interviews are by invitation only.